Children's Hospital Los Angeles (CHLA) is a 501(c)(3) nonprofit institution that provides pediatric health care and helps our patients more than half a million times each year in a setting designed just for their needs. Our history began in 1901 in a small house on the corner of Alpine and Castelar Streets (now Hill St. in Chinatown) and today our medical experts offer more than 350 pediatric specialty programs and services to meet the needs of our patients. CHLA is a provider of more than $316.2 million in community benefits annually to children and families. As the first pediatric hospital in Southern California, CHLA relies on the generosity of philanthropists in the community to support compassionate patient care, leading-edge education of the caregivers of tomorrow and innovative research efforts that impact children at our hospital and around the world. Since 1932, Children's Hospital Los Angeles and the faculty of Keck School of Medicine of USC have worked together to create one of the world’s finest pediatric care centers. As a team, we work together on innovative programs and multi-disciplinary research for our community and beyond. Thanks to our affiliation with the Keck School of Medicine, CHLA is a premier teaching hospital, training future caregivers for the children of tomorrow. Since 2013, CHLA has partnered with the Providence Health & Services to enhance pediatric care for children and families in the San Fernando Valley. The CHLA Medical Group provides medical oversight and leadership for Providence Holy Cross’ neonatal intensive care unit. Physicians of the CHLA Medical Group provide medical oversight and coverage for the medical center’s neonatal intensive care unit. AltaMed has been a partner of Children’s Hospital Los Angeles (CHLA) since 2005 providing community-based, federally-qualified outpatient general pediatric care located on the CHLA campus at Sunset and Vermont. CHLA’s world-class physicians are now at AltaMed in South Gate. Hollywood Presbyterian Medical Center’s NICU is directed by renowned neonatologists from Children's Hospital Los Angeles and staffed by nurses, nurse practitioners, pharmacists, and respiratory therapists with special training in working with these very special babies. Children's Hospital Los Angeles has a reputation as an award-winning hospital. Whether it is for our national rankings for providing significant and comprehensive medical care services and programs that meet a sick child's entire needs or continuing to raise the bar nationally on our patient safety and quality health care programs within our walls, we continue to be a hospital that sets the standard for care. 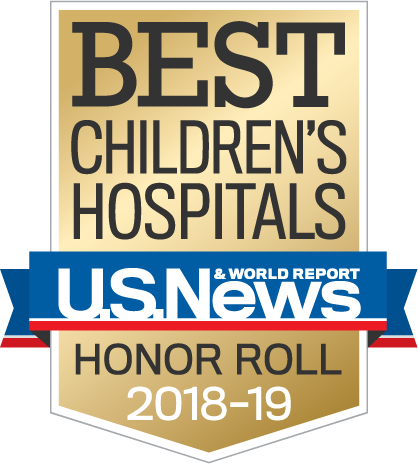 Our hospital has been ranked as a top health care facility for children by U.S. News & World Report magazine every year since the magazine began ranking pediatric hospitals in 1990. In U.S. News & World Report's most recent rankings, we were ranked the No. 1 hospital in California for caring for children. Becker’s Hospital Review listed Children’s Hospital Los Angeles as one of the “100 Great Hospitals in America”. We were the only freestanding children’s hospital in California to make the list. The Medical Staff at Children's Hospital Los Angeles includes 528 physicians - 94% are board-certified in their specialty or specialties. Our faculty members are regularly ranked among the leading healthcare practitioners in the nation by their peers, and listed in distinguished publications such as Best Doctors in America and America's Top Doctors. The American Nurses Credentialing Center has accorded our hospital with Magnet Recognition®. Magnet® status is used as a national benchmark of the quality of care provided by a hospital's patient care services staff members. CHLA is eighth among U.S. pediatric hospitals in procuring National Institute of Health (NIH) grant funding. Our research faculty are conducting basic and translational research and many are elected members of the Society for Pediatric Research. We are the only hospital in the nation to serve as headquarters for four pediatric oncology multicenter clinical trial consortia, testing innovative therapies, including New Approaches to Neuroblastoma Therapy (NANT), Therapeutic Advances in Childhood Leukemia and Lymphoma (TACL), the Head Start Consortium for Pediatric Brain Tumors, and the Pediatric Bone and Marrow Transplant Consortium (PBMTC). The Emergency Nurses Association bestows the Lantern Award 2013-2016 to our emergency department because we exemplify exceptional practice and innovative performance in the core areas of nursing leadership, practice, education advocacy and research. The Cardiothoracic Intensive Care Unit (CTICU) was awarded the 2017 silver Beacon Award for Critical Care Excellence by the American Association of Critical-Care Nurses. At CHLA we understand that in order to provide the best experience for all of our patients, it is crucial to ensure that we keep the thousands of medical records that we deal with every day secure. Our information technology department works hard to create a reliable computer network to keep these important files safe, and we’ve been recognized for our dedication to patient privacy. We’re proud to have been named as one of the American Hospital Association’s (AHA) Health Forum’s Most Wired® 2017. AHA determines winners through a survey which measures how hospitals are using technology to support patient safety and overall care. This year, 698 total participants were surveyed, with CHLA being named as one of 21 children's hospitals to receive the designation. Imagine magazine is our institution's annual report covering our groundbreaking efforts to providing state-of-the-art care for children, lead national and international research and train tomorrow's caregivers. The publication also represents some of our best storytelling, chronicling our unique patient experiences, highlighting our superior care for children and documenting our breakthroughs in research. Children's Hospital Los Angeles is a non-profit, private pediatric hospital under the leadership of a volunteer Board of Directors and Foundation Board of Trustees, consisting of community leaders and physicians. As a pediatric academic medical center, we oversee care through five departments and divisions within each. Education is a cornerstone of the mission of CHLA. We are one of the country’s premier teaching hospitals. In addition to being the pediatric training center for medical students at the Keck School of Medicine of the University of Southern California since 1932, we are the founding hospital of the Versant RN Residency in Pediatrics as well as home to a vast array of internships, residencies and fellowship programs to support the training of tomorrow's caregivers. Children's Hospital Los Angeles (CHLA) is one of the only hospitals in Los Angeles and its surrounding region that is entirely focused on the care and treatment of children. Every element of our facility is designed to care for a developing child's needs. The most important people supporting a child's recovery are their family and loved ones. Find out more about CHLA's award-winning care. The 114-year history of CHLA is a story of exceptional leaders advancing and transforming a community in support of the health of children. Children's Hospital was founded at a time when few people thought a hospital for children was possible, let alone that it could -- or would -- evolve into one of the world's outstanding pediatric healthcare facilities. Families bring their children to CHLA because we are the home hospital for physicians of the Children's Hospital Los Angeles Medical Group. Many of our physicians are pediatric faculty of the Keck School of Medicine of USC. Collectively, more than 700 clinical experts and house staff reflect the diversity of our patient population and community. All care about the welfare of children. Children’s Hospital Los Angeles is home to The Saban Research Institute, which comprises the basic, translational and clinical research of CHLA — one of the few freestanding pediatric hospitals where scientific inquiry is combined with clinical care devoted exclusively to children. It is eighth in the national children’s hospitals in procuring National Institute of Health (NIH) grant funding. Find out more about The Saban Research Institute. Having volunteers participate in research studies and clinical trials is critical to our research efforts. Thousands of children and families are involved in our patient-centered studies every year. Many of the treatments used today are based on the results of past research studies and clinical trials conducted with our patients. Our scientific and clinical experts take the best ideas from the laboratory -- to the patient -- in the form of promising new treatments. By searching our study directory, you may identify research that could impact the life of your child or of another child you know. Because the number of available research studies and clinical trials for children nationwide is small, every participant makes a significant contribution. Participate in a study.